The Blind Bear downtown recently began offering lunch on Wednesdays and Fridays. More details to come in Hannah Sayle's Food News column in the issue hitting the stands tomorrow, but here's a sneak peek. We'll start with the Bear Balls ($6). It's hard to go wrong with what is basically a mozzarella cheese stick. But these balls, breaded with panko, are particularly good. Here's the vegetable plate I ordered. 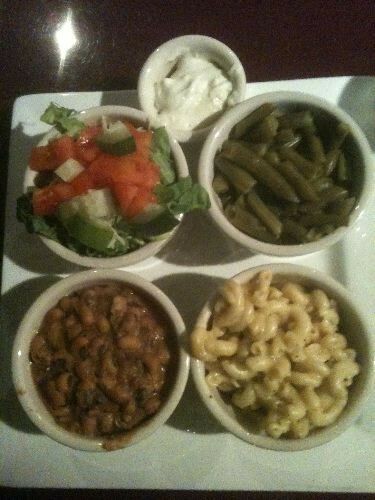 It's a side salad, black-eyed peas, green beans, and a pepper-jack mac-and-cheese. 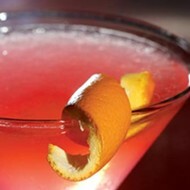 Owner Jeannette West said that the menu is still evolving. On this day, the vegetable options included a wealth of beans and mac-and-cheeses.